By now you have probably heard of Jamie Casino, the Georgia personal injury attorney who had the balls to take a big risk: releasing an epic and controversial commercial during the Super Bowl. The video has received a lot of attention, going viral with over four million views on YouTube in less than a week. This is the stuff of attorney marketing dreams; making a viral video, being interviewed on the national news and having multiple, high-quality websites pointing back to your site. Talk about organic link attraction with maximum exposure! Except for one thing: his webmaster screwed up. Bad. The webmaster for Jamie Casino made an error so egregious that while the viral video got Mr. Casino a boat load of media attention, almost none of the articles written about the video pointed back to his website. Why not? The webmaster neglected to remove the Disallow: / from the robot.txt file on his website. This error made getting to the attorney's website much more difficult than it should have been, and it royally screwed up what could have been a slam-dunk marketing effort. When you are building a website, you don't want it to be indexed. This is because the website is under development and you aren't ready for the public to see it. So what webmasters usually do is add one line “Disallow: /” to the robots.txt file to tell search engine crawlers that they should not crawl and index the website, which is a good thing...usually. The problem isn't that the webmaster blocked the site when it was under construction, it's that he never removed this line when the old website was redirected to the new website. This means that the new, fancy-schmancy website wasn't being indexed properly. Google, Bing, Yahoo!—none of the search engines was told to crawl and index the site. It wasn't showing up in search results the way it should and consequently probably missed out on a ton of link opportunities. This is a big deal: a smashing, flaming failure. A true #marketingfail. Why? Because all of the high-quality sites that were reposting his video—Buzzfeed, ABC News, Slate.com, and People magazine, to name a few—weren't referencing his website. 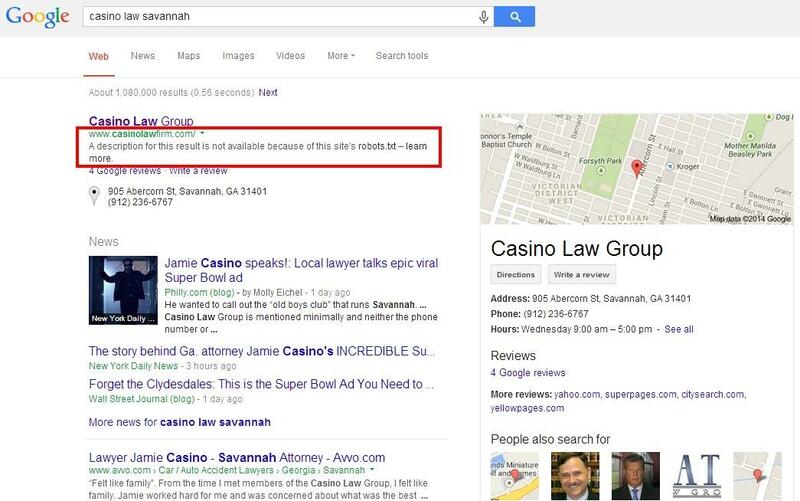 The law firm missed out on hundreds of link-building opportunities, not to mention the loss of traffic. It's a big old palm-to-forehead, "D’oh!" moment. How Bad Was it for Jamie Casino’s Marketing Effort? He spent gobs of money on a commercial that would run during the Super Bowl. He was smart and created a new site in the hopes that the commercial would get some attention. He did everything right. 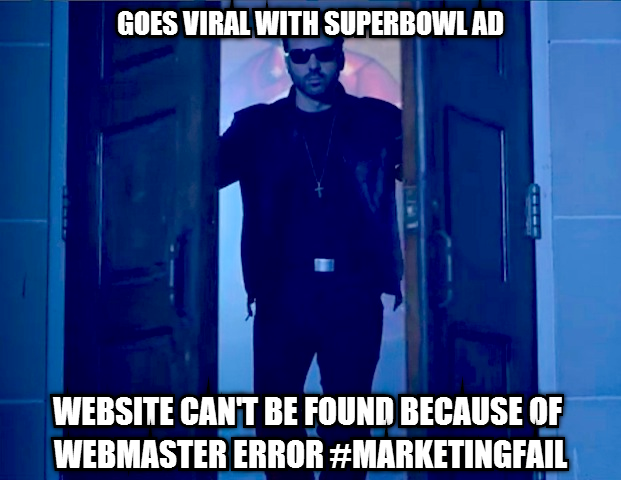 His webmaster let him down. You must make sure all of your marketing efforts are aligned so you get the most bang for your buck. If you are going to be doing commercials—especially during the most expensive ad spot of the year—or any kind of offline marketing effort, make sure your webmaster is aware of the potential traffic that it may draw to the brand and your website. Don’t try and do too much at once. I cannot be not sure when the new website was launched. This could have been an issue for a while. However, if he was trying to launch a new website right before he was going to be attracting that kind of national attention it was bad timing. The moral of the story is this: The devil is in the details. Dot your i's and cross your t's, making sure that you communicate well through every marketing channel. You don’t want to be the attorney who missed out on a killer opportunity to build your brand because of a single, totally avoidable mistake. To ensure you're communicating efficiently, be sure to hire a marketing company that is detail oriented and easy to communicate with. They also need to know and understand how to market across multiple channels, not just the web, TV or print. Don't be a missed opportunity, call 888-886-0939 and see what we can do to ensure that you make the most of every big story that comes your way. When your big story drops, will you be ready to run? We will be.